We were a small but mighty group singing "Daisy Daisy" at the annual Canadian Derby. It looked like we might get rained on, but in true Derby tradition, the sun came out and the stands were packed. 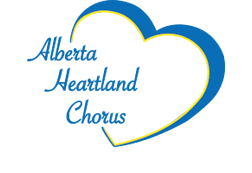 This is an annual occasion for Alberta Heartland Chorus. We have introduced the main race "The Run for the Daisies" for almost as long as we have been a chorus. After we sang, we watched the race and were thrilled with our vantage point from Centre field. Some of our members were even presented with flowers. You can see their picture in our public gallery. It was an exciting day, but it may the end of our annual tradition as Northlands is talking about cancelling racing. Wherever it goes and whatever "the Canadian Derby" becomes, we will always remember all the fun we have had and all the wonderful people we have met at the racetrack. EDMONTON, AB (August 20, 2016) – Shamaree Muir rode local favourite Ready Intaglio to victory on Saturday, August 20 in the 87th running of the Canadian Derby at Northlands Park Racetrack & Casino. This year’s finish was one of the closest finishes in recent history. The last seven editions of the Canadian Derby have broken the $1-million dollar wagering mark. This year, wagering reached $1,166,083 at the running of the 87th Canadian Derby. Shamaree Muir is one of the youngest jockeys to win the Canadian Derby at the age of 21. Muir hails from Jamaica where his previous biggest win was the Super Stakes. This up-and-comer was the two-time leading apprentice in Jamaica. Now he has captured a Grade III, solidifying his spot as a top jockey in Western Canada. Trainer Amber Meyaard and her husband Jim won the Canadian Derby in 2010 with No Hesitation. Ready Intaglio sprinted through on the inside and survived an inquiry to prevail at 7-2 to win the 87th Canadian Derby. Leading up to his derby win, Ready Intaglio won both of his derby prep races the Count Lathum and the Ky Alta. This is owner Robbin Martens’ first Derby victory. Coming in second was Solve ridden by Dane Nelson and trained by Robertino Diodoro followed by The Accuser ridden by Damario Bynoe and trained by Rob Chabot.